.........Hehehe don't panic you haven't been asleep and woken in January 2013....The Craft Barn are hosting their Calendar Challenge again this year and I missed joining in last time so hopefully I am going to be able to make it to the end this year!!! 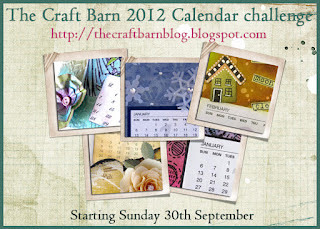 Great Prizes and offers at The Craft Barn pop over and take a look! 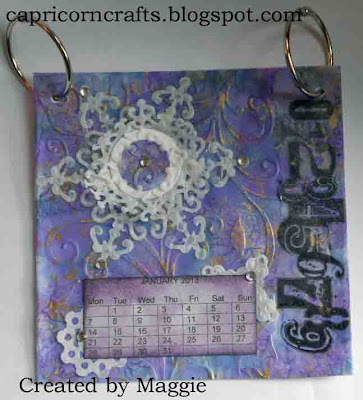 I have decided to make a page for each month for this challenge and have added big metal rings to hold them all. A really gorgeous textured creation Maggie and those colours are just stunning. Oh so Pretty page! Great colors and texture! What a great page! Bravo! Fantastic page. Love that snowflake especially. Love the colours & the texture makes the whole page so strokable. Great colours you've achieved on the back of the vellum - love it!! Thanks so much for sharing your calendar page at ABAC and I do hope you'll join us again next time. Beautiful page ! I have used alcohol inks in my entry too but honest I didn't copy! So pretty! I love the colors and the gold accents really set it off! So glad you joined us at Anything But a Card!